I love being a mom. I have been a mom now for almost 7 years and nothing anyone told me could have prepared me for the incredible journey that motherhood brings. My first baby had horrible colic and I guess I am thankful...because when her brother was born, he was SO good. Get the hard baby out of the way first and the rest will be smooth sailing, right? Haha! Both of my boys were very good babies and Rebekah, my most recent baby has been a really good baby as well. Anyone who knew me when my first baby was born though, felt so bad for me. It was tough, but we made it and now my first baby girl is getting ready to turn 7 years old!!! WOW! That was quick. Baby care has never really been hard for me to figure out. From the time I was a pre-teen, I was caring for babies and pretty much knew the ropes when it came to the ins and outs of taking care of babies. I did alot of babysitting as well and so all of that prepared me well for being a mom. At Wellements, our company philosophy is to provide your baby with the best, most natural and most effective products that will benefit them for years to come. No unnecessary preservatives. No damaging additives. No harmful chemicals. Just pure, wholesome goodness. Your baby’s health is the most important thing, both now and as they grow – and that’s why we make it our number-one priority. Wellements is completely dedicated to making all-natural, safe and effective baby products. All of our products are made with simple, natural and organic ingredients of the highest quality and purity, with no unnecessary preservatives, chemicals or additives. They’re created in certified facilities and formulated based on comprehensive scientific evidence. The Wellements team is devoted to your baby’s well-being. We know that a healthy foundation makes for a healthy life, and that’s why we believe in wellness from the beginning, naturally. A healthy baby is a happy baby! 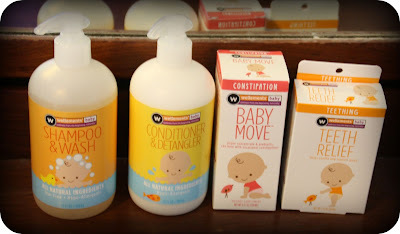 I have reviewed many natural baby products here on my blog and am always excited when I discover a new company to share! When I received the opportunity to review some products from Wellements Baby, I was very excited once again. So, for this review I was sent Baby Move (for occasional constipation), Teeth Relief (for...you guessed it...teething! ), Shampoo & Wash and Conditioner & Detangler. My package arrived a week or so ago and I eagerly dug right in and started to check out these amazing products. Right now, my primary issue with my baby has to be teething. She just turned 1 two weeks ago and so far, she only has her two bottom teeth. I can see at least four getting ready to surface and that means one thing...she is GROUCHY!! Teething is the worst stage of babyhood, I think and having products to help you get through this tough stage is key. 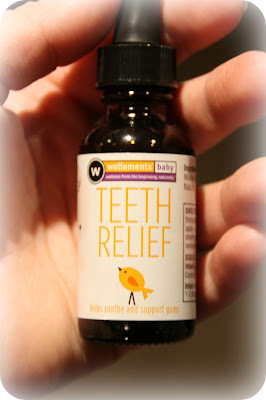 The Wellements Baby Teeth Relief is wonderful. 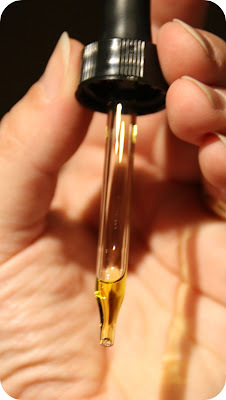 Of course, there are only natural ingredients in this oil-based pain relief and I have been giving it a try. Teeth Relief comes with a glass dropper and is super easy to use. The ingredients are: Olive oil, white willow bark oil, clove oil and natural vitamin E. It is interesting that they include clove oil because when my husband has a tooth ache, he chews on some cloves and it numbs the pain. I was really glad to see that ingredient simply because I know clove oil for teething works. All you do with this is rub a small amount on baby's gums and it gently yet effectively relieves the pain. I have tried this with Rebekah and it seems to give her some relief. I tried some myself and it doesn't taste bad at all, it did a pretty good job of numbing my tongue though so I have a pretty good idea of what it does to my baby's gums. Teeth Relief retails for $8.99. 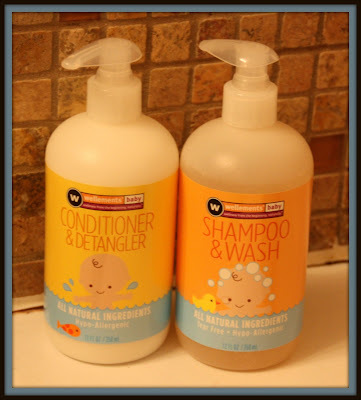 The next two products we tried out were the Conditioner & Detangler and the Shampoo & Wash. There is no scent to these products at all, and they are also hypoallergenic. 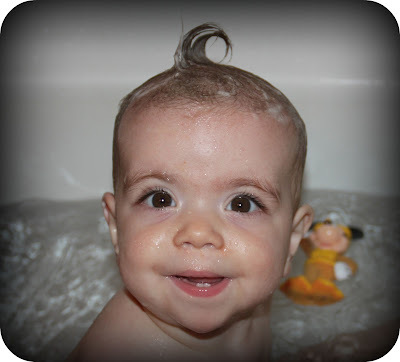 My baby girl LOVES bath time and any time we are in the tub, we have a blast. I love this Shampoo & Wash combo...it works well for my gorgeous baby girl's hair (what little hair she has, haha!) and her body. As you can see, there was minimal foaming from the shampoo and it gave her really good coverage. I actually used the Conditioner & Detangler on my 6 year old and it worked really well when I tried to comb out her hair after her bath. Her hair gets SO knotted, this worked great to keep those nasty knots at bay. The Conditioner & Detangler and Shampoo & Wash both retail for about $8.99. We haven't had to use the Baby Move yet...I have recently introduced whole milk to my baby's diet and it doesn't agree with her tummy at all. She has had diarrhea ever since we tried the milk so constipation is non-existent right now. :) However, after looking at the ingredient list (Filtered water, organic prune concentrate, organic vegetable glycerin, citric acid, polydextrose (prebiotic), galactooligosaccharides (prebiotic) ) I am confident that it will be a huge help for when constipation strikes. It does hit Rebekah quite often so having this on hand will be great. That prune juice is VERY effective. 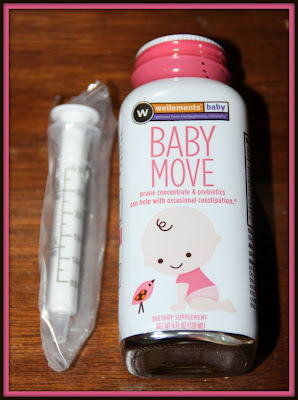 :) Baby Move retails for about $10.95. After using all of these Wellements Baby products, I am confident in saying that I love what they have to offer. The whole natural aspect to the company is wonderful and their products are top of the line. I definitely recommend them to all parents and caregivers. 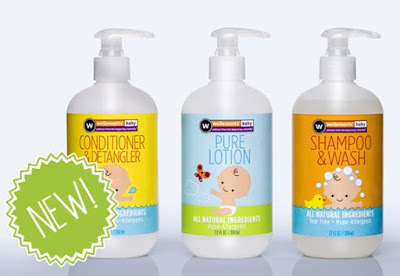 You can find Wellements Baby products at Walgreens, Kroger, Whole Foods, The Vitamin Shoppe and at select Target stores. Check out their store locator to find a store near you. Also, be sure you stop by Wellements Baby's Facebook Page and Twitter page as well...introduce yourself and let them know what YOUR favorite product is. Disclaimer: I received no monetary compensation for this post. I did receive free product for review purposes. All quotes and stock photos are from the Wellements Baby website and email. All thoughts and opinions are 100% mine.